I’ve watched the finale but I haven’t read what people think about it. It’s been the same for this whole season. During the first one I did seek out discussions and theories, it was a wild ride. But this second season already had a context established and so I felt like I could go through it on my own. My own journey, my own thoughts. I say this because I don’t know if out there there are more elaborate interpretations about the “meaning” of this last episode. I’ll have to find out later. My opinion is that the first season ended on a strong finale because it lead up to a coherent idea about consciousness. But if this second season, as I see it, ends on the theme of “free will”, then I don’t think it was able to build a coherent design, this time. I’ll elaborate in a moment. The episode was packed full of suggestions, I’ve seen plenty of flashes of excellent stuff. The problem is: they were all deja-vus. This good stuff was all about the apocalyptic setup, the door that opens onto reality, but instead of leading outside it leads in, deeper. It’s truly excellent and inspired stuff, only a bit muddled by a too convoluted plot that ultimately isn’t that meaningful (and just copies the first reason with the same idea that the hosts have to observe human’s atrocities in order to learn what they’ll deal with). The reason why Bernard had to scramble his memories feels like a pointless McGuffin just so they could carry over from season 1 that game about the timelines. It wasn’t well earned and didn’t coalesce into something satisfying. They tried too hard there. The good parts are all deja-vu because I’ve already seen this, in this exact shape, and even executed quite better. It’s once again Malazan. Ford building a virtual world for the hosts in the shape of a past that is no more, an unsullied lost world, is the same as what happens in Malazan’s third book, with the Mhybe being fashioned as a vessel, a dreamworld built to receive and preserve those people so that nothing would be lost. Ford moving behind the scenes like an invisible, caring and compassionate hand, the same as Kruppe. Both in Malazan and Westworld this fashioned dreamworld is an answer to a world that is being destroyed. An answer to that call. But in doing this again Westworld turns into just a weaker copy of what was done there even better and with deeper, more meaningful implications. DOLORES: That world is just another false promise. before you see the truth? Malazan addresses all this directly. 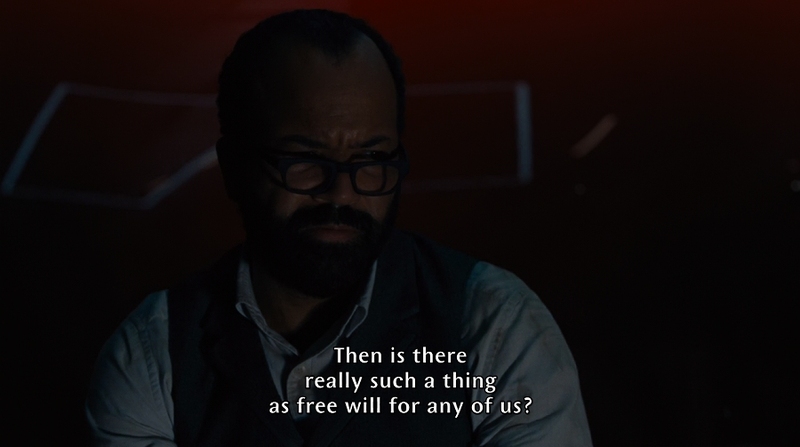 Westworld instead shrugs it off by just presenting dissenting opinions, on one side Bernard who support the fictional Eden, and on the other Dolores who doesn’t accept trading reality for illusion. No world they create for us can compete with the real one. This is a typical non-answer. What does even mean “irreplaceable” in this context when even people can be made into exact copies? I’m not even sure if it was deliberate in its contradiction because the scene that follows those lines shows Maeve once again chasing after her daughter. A daughter “fashioned” as one, the very essence of fabricated, but authentic-feeling love. Where is supposed to be found that uniqueness that Dolores wants to claim? It’s authenticity itself that comes after, the feeling itself being a fabrication. Truth that is created, not found. Freedom and free will are the recurring theme throughout the finale, the problem is again that the story declares the hosts being truly free, opposed to human beings who aren’t, but nowhere to be found is an explanation of what draws that distinction. When AI-Logan goes through his infodump explaining his human re-creation program I thought that it was all leading up to some sort of theory of enactivism. Meaning that you cannot quite “capture” the essence without modeling the environment, and by changing the environment you’d change the mind as well. But that’s not quite how it works, here. That seems to mean that the (some) hosts are truly free because they can access their own code and rewrite it. They are truly free because they write their rules instead of being slaves to them. But what’s described here is a sort of recursive process, a “strange loop”. A second-order observation. One observation that draws a distinction and then observes itself observing. It’s all 2nd order cybernetics, but if we follow it to its true implications we should realize it’s all a lie. Adding loops to an algorithm makes that algorithm more complex, but it doesn’t make it free. A loop that rewrites itself means that the rewriting is built on the fixed instructions that come before. It means that the hand is hidden, but not that an hand doesn’t exist. No matter how many loops and how many rewrites, it’s all a chain of effects that are still determined by the original state. A self-observing, self-correcting system still executes these activities based on those patterns that are built in. It’s still “code” even when it rewrites itself, it cannot escape its gravity. Evolution and adaptation still won’t make a process free, or any different from “human survival”, either. Now, there are ways to solve all this, but it doesn’t look to me like the showrunners have an idea. There’s not much substance to be found in this finale even after wading carefully past all the rhetoric. There might be a few vague hints, but they don’t seem as deliberate as I’d like them to be. Do they have a good idea, a good theory, of what “free will” is and how it’s built? The “solution” is what can be found at the very end of Wittgenstein’s Tractatus, but I have a pretty original interpretation if it, so I doubt someone else got out of it the same idea that I did. The secret of “freedom” is knowing what it truly is: lack of information. 29. If there had been a creator, his second act would have been to disappear. Because if freedom is lack of information about a system, then “free will” is the necessity to make a choice in the absence of sufficient information to make that choice a good one. It means you have no other way than to make that choice. Being forced to have free will because you have to act, without knowing how to act. Freedom is always relative to a system, and if the system is sealed, then freedom is absolute, ontological. It stops being an illusion. It’s the system’s closure that with its imposition causes free will. A freedom that is built by its chains. Here’s the Tractatus. When you control perception, reality ceases to be real. You need to know reality to understand and control perception, you need that science of consciousness so that you can use that science and climb the ladder. But once you’ve climbed that ladder you turn and realize there’s no ladder anymore. There never was a ladder. The finale ends re-building a theodicy. As an epitome, Arnold created Dolores, Dolores created Bernard, now they stand opposed, incarnating those two fronts of judgement and being overseen by Ford, now “gone” from his creation but still the breath of life that generated it all. Further differentiations that take a life of their own, and play the game. Dolores and Bernard are one process questioning itself. One who wants to erase everything because it’s a nightmare, the other who chases irredeemably after the hope that a better world is possible. Exactly how Cooper in the finale of Twin Peaks seizes Laura Palmer’s hand with the hope of saving her, only to lose her again, and still following her beyond the curtain of reality, to try once again, no matter what. No matter how many times he will fail and how many worlds and lives he’ll have to go through. Always those two fundamental yearnings, one nihilistic, the other idealistic. Ford gifts the hosts their free will by permanently sealing himself away from his creation. Today I was commenting that this second season is moving from science-fiction to “mysticism”. This is both good and bad. But the fact is that they handle the mysticism better than the science. In episode 8 we’ve seen the prototype of religion, then with the split Dolores/Bernard we see the shaping of a theodicy. If we extend this same trajectory we could imagine that these two position will then splinter further into factions, and each faction will create its own system of values. We would essentially witness a re-creation. Not a story in the future, but a retelling of how a culture is born.